The Parasite Eve series revolves around the idea that the mitochondria within human and animal cells have a collective will. The series assumes endosymbiotic theory is true, meaning some organelles within our cells were originally independent organisms that merged with our cells for mutual survival. Parasite Eve's mitochondria have greater goals than powering our cells and decide to take over the world. To do this, they possess a human host, known as Mitochondria Eve, and develop a nasty habit of commanding all of the mitochondria in a given human or animal to ignite at once. This control lets Mitochondria Eve trigger spontaneous combustion and monstrous transformations. Aya Brea, protagonist and New York City cop, can utilize her own mitochondria to protect herself from Mitochondria Eve's influence. As the game progresses her unique mitochondria provide near-magical powers like rapid healing, magical bullets, and even a full angelic transformation. Aya's case is unique because she doesn't understand what's going on with her body any more than the players do. She, like most players, is not a biologist and has no idea what any of this mitochondria business means. Parasite Eve takes place over the course of six days, which leaves her little time to study what's going on. For all of its problems, the Tome of Eternal Darkness at least spelled out the source of magic and provided nearly a dozen unlucky precedents. Likewise, people in the world of Final Fantasy VII grew up with materia and even children know how to use it. Aya's only resource on her new powers, her enemy, and ultimately her identity is a Japanese scientist working off of what research he could throw together after an event that took place in the game's source novel. The spontaneity of the Parasite Energy system's developing powers lends to the game's unpredictable atmosphere. The only thing Aya really knows is that she's similar in many ways to Mitochondria Eve, which the game makes even more evident in the non-canonical ending players get the first time they complete the game. Fortunately, she actually takes comfort in her potential and marches forward on a suicide mission largely reliant on her own unknown power. 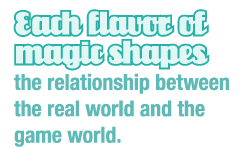 Each flavor of magic shapes the relationship between the real world and the game world. The source determines if players are expected to believe in a setting or if that setting is a well-constructed lie. Even the most fanciful forms of magic can help players understand and sympathize with a character's moral dilemmas, fears, and hope. Magic challenges players, rewards creative efforts, and sometimes even shares a little bit of insanity. William Bloodworth always keeps an Elder Sign handy when working with new magic. Hear more of his mana-deprived banter at www.flavortextpodcast.com.